Contera™ Panoramic megapixel IP cameras provide an all-in-one solution for wide-area video surveillance. 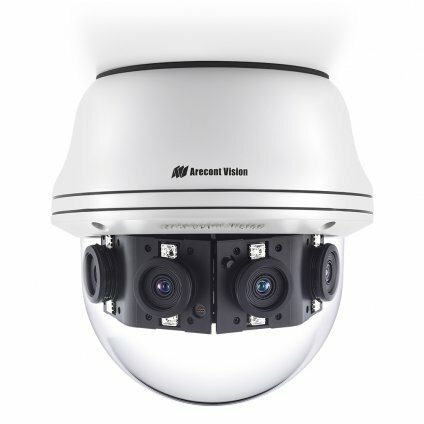 Four sensors and lenses are housed in an outdoor-rated IP66 and IK-10 impact-resistant dome enclosure. The cameras are available in a 180° configuration and resolutions of 8- and 20-megapixel (MP). A single Contera Panoramic camera can replace multiple conventional cameras with the ability to zoom into multiple regions of interest. Their return on investment is easily measured any way you view it. Regardless of the time of day, the Contera Panoramic is prepared for any lighting condition. For applications with poor lighting conditions, Enhanced WDR™ (wide dynamic range) at 120dB provides the best visual balance to shaded and bright light conditions. For clear color images in low-light, NightView™ offers strong low-light sensitivity for capturing details in extremely poor-lit scenes, which is further enhanced by LED illumination built into each sensor gimbal. Arecont Vision was the first to bring H.264 to the mainstream market and recently developed SNAPstream™ (Smart Noise Adaptation and Processing) technology for reducing bandwidth without impacting image quality. Today we are proud to offer our next generation H.265 with SNAPstream+™ smart codec capable of delivering high quality video while saving over 50% of the data rate to reduce or prevent strain on the network. The camera’s power can be supplied via a Power-over-Ethernet (PoE - IEEE 802.3af) compliant network cable connection. The Contera Panoramic is ONVIF (Open Network Video Interface Forum) Profile S compliant, providing interoperability between network video products regardless of manufacturer.